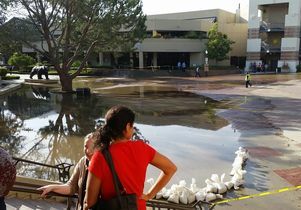 A water main break on Sunset Boulevard flooded parts of the UCLA campus. Update posted at 9:10 p.m.
A city of Los Angeles water main ruptured under Sunset Boulevard Tuesday afternoon, opening a large hole in the pavement that closed the street during rush hour and flooded parts of UCLA’s north campus. The 93-year-old steel pipe broke at 3:39 p.m., according to the Los Angeles Department of Water and Power. An estimated 8 to 10 million gallons of water flowed toward the campus or into storm drains. UCLA's intramural field, North Athletic Field and Drake Stadium — where a new blue and gold track was recently installed — were quickly inundated. Water spilled into underground parking structures 4 and 7, partly submerging dozens of vehicles, and pooled in Bruin Plaza. Campus officials were especially concerned about standing water on the floor of Pauley Pavilion, UCLA's iconic arena. 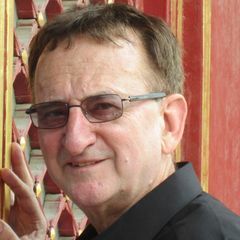 "Unfortunately, Pauley Pavilion took quite a bit of water," Chancellor Gene Block said at an evening news conference aired live on Los Angeles television. "It's painful." Officials said that damage to Pauley Pavilion, the adjacent John Wooden Center and the parking structures would be assessed overnight and on Wednesday. Athletic Director Dan Guerrero said later Tuesday night in a statement, "we are still gathering information and, to the extent possible, assessing the damage to our athletic facilities affected by the water main break. Regarding specific inquiries and concerns about Pauley Pavilion, most people are aware by now that the floor and locker rooms sustained significant flooding. The water will be removed from the floor tonight. We will then reassess the situation tomorrow morning and be able to provide additional information at the appropriate time." The campus will open as scheduled Wednesday. Visitors to campus on Wednesday were advised to avoid Sunset Boulevard, which will remain closed. "Buildings and operations related to our academic enterprise, residence halls and the Ronald Reagan UCLA Medical Center have been unaffected," Block said in a message to the campus community. 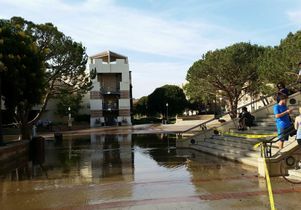 "The campus will remain open and classes will be held on Wednesday; however, UCLA summer camps and the Fernald and Krieger child care centers will be closed. Further information regarding child care and camps will be provided tomorrow." The 30-inch main that broke carries water under high pressure from the city's Stone Canyon Reservoir in the mountains above UCLA. When the water began flowing on campus, crews stacked sand bags in front of the north end of Pauley Pavilion and closed off flooded areas. Water poured down stairwells into the parking structures amd got inside the Wooden Center, which houses recreation facilities, and the J.D. Morgan Center, which houses athletic staff and administration offices and UCLA's Athletic Hall of Fame. Authorities quickly restricted access to parking structures 4 and 7, forcing commuters to find alternative transport off campus. Chancellor Block said Tuesday night that anyone who has a vehicle stranded in the parking structures can visit this web page for more information. The city Department of Water and Power began gradually shutting off the water around 5 p.m. Officials said that turning off the water had to be done slowly to prevent additional pipe ruptures. Sunset Boulevard was closed between Hilgard Avenue and Veteran Avenue. Parents with children attending summer camps on campus were able to pick them up at the flag pole near Royce Hall. A city of Los Angeles water main broke shortly after 3:30 p.m. under Sunset Boulevard near Westwood Plaza. 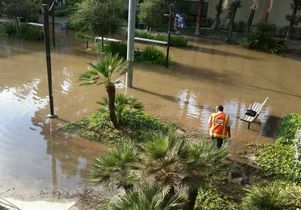 Flooding has closed streets and affected parts of the UCLA campus. As of 7 p.m., the water flow was 90 percent shut off, according to the Los Angeles Department of Water and Power. UCLA officials are assessing damage. Update 6:23 p.m. UCLA Transportation has announced that emergency personnel vehicles and equipment will be deployed from Lot 36 this evening. Those who park in Lot 36 are asked to move their vehicles immediately. Update 6:16 p.m. LADWP recommends the following detours for commuters in the area: Drivers traveling westbound on Sunset should go south on Beverly Glen, then west on Wilshire Boulevard, then back north on Veteran/Sepulveda to get around the closure. Eastbound traffic should head south on Veteran/Sepulveda, then east on Wilshire Boulevard, then north on Beverly Glen. In addition, the Ronald Reagan UCLA Medical Center reports that the water feed to the hospital and other UCLA Health System locations are not impacted and are not anticipated to become impacted. Due to street closures, traffic is congested in the surrounding area, however the medical center remains accessible. The hospital has not received any patients as a result of the flooding. Update 6:04 p.m. Parents with children attending a summer camp at UCLA can pick up their children at the flag pole near Royce Hall. Update 5:56 p.m. Los Angeles Department of Water and Power has announced that it is in the process of shutting off the water. The shutdown must take place gradually to avoid additional water main breaks. Sunset Boulevard is closed between Hilgard Avenue and Veteran Avenue. Update 5:51 p.m. Operations at Ronald Reagan UCLA Medical Center are not affected by the water main break. Update 5:34 p.m. Authorities have closed access to parking structures 4 and 7. People should not try to retrieve their cars. Update 5:13 p.m. Water has been seen inside the J.D. Morgan Center, which houses athletic staff and administration offices, the George Kneller Academic Center and UCLA's Athletic Hall of Fame, and water has been spotted inside the John Wooden Center. UCLA Transportation sent an email telling people that they may try to retrieve their vehicles from parking structures 4 and 7, but must obey instructions from emergency personnel. Update 4:57 p.m. Workers are placing sandbags in certain areas across campus, including on the north side of Pauley Pavilion, where some water has already gotten inside. Non-emergency personnel from UCLA are being asked to head south, away from Sunset Boulevard. Update 4:51 p.m. Parking structures 4 and 7 have been closed. Water is visible on Bruin Plaza, North Athletic Field, the intramural field and in Drake Stadium. 4:20 p.m. Sunset Boulevard is closed at Hilgard Avenue to Westwood Plaza. People are advised to avoid the area. Water on Bruin Plaza on July 29, 2014.